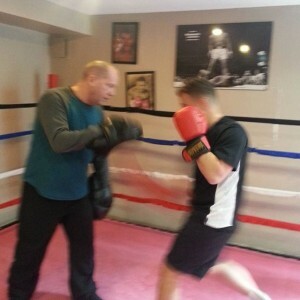 Boxing at Golden Gloves Fitness in Vaughan, ON. Golden Gloves Fitness is a sports gym in Vaughan that is dedicated to bring you the best fitness and boxing training in the Greater Toronto Area. All of our classes are customized to your requests. Walk-ins & inquiries are always welcome, please feel free to fill out a form on our contact page for more information. We are open from Monday to Friday, 7 am to 9 pm & on Sundays, 8 am to 2 pm. There are no contracts, sign-up or membership fees. We are here to improve your health, wellness, boxing and fitness. There is free in front parking, lockers, and change rooms for all to use. All boxing equipment will be provided to you, we want to make it easier for you to become fit! Classes are offered to all ages, levels, genders, capabilities and orientations. All you need is your gym clothes, inquire us a:t 416-569-9381 today! We offer intensive Mixed Martial Arts workouts that include but are not limited to: our own style boot-camp training, hand-to-hand combat, SAMBO, and self-defense techniques. 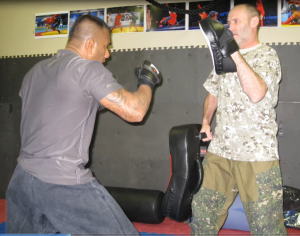 Our trainer Slava, has over 20 years experience in intense boot camp style training. 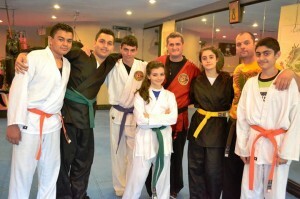 He is here to teach you self-defense, counter-attacking and achieving the max potential of your body. He is here for you and your fitness requests. In addition, we offer intense boot camp lessons that are original at our gym only. We have come up with techniques that will have your whole body moving! Our boot-camp program will move every muscle in your body that is perfect for fitness. Our system is bound for your health and success. Click on the link above or call us today for more information! SAMBO stands for self-defense without weapons in Russian. This Martial Art is perfect for you to diversify your counter-fighting skills and trying something new! Exclusive at Golden Gloves Fitness in Vaughan, contact us today about more information about this type of Martial Arts class. As a separate program, we offer Karate and Qi-Gong lessons that are taught by Grand Master Terry Popovich. As a 5th degree Black-belt, Terry begun his career in the year 2000 and has expended to many high schools throughout the Greater Toronto Area. Sessions are offered to everybody. A free uniform is handed-out upon sign-up. Feel free to ask us about this great option today. Qi-Gong Qi-Gong is the practice of aligning the breath, body, and mind into one session. It focuses on the “chi” or life energy . Contact us today to book a session with Grand Master Terry or please do not hesitate to contact us for more information. Our weight loss program is very effective and stimulating that is designed just for you! Proven to control weight, come-in to our clinic and check out our Ideal Protein products. Click here for more information. Feel free to call us anytime for more information.